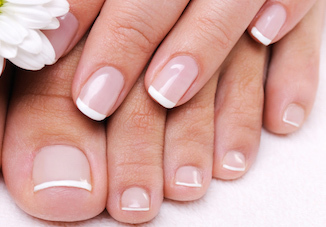 Our manicure & pedicure services are done using salon professional products. We use KAESO & SALON SYSTEM. We do not share any tools between therapists to eliminate any risk of cross contamination to our clients. All our tools are sterilised after every use. Like a facial for the hands the indulgence manicure will leave you feeling relaxed. Our products contain plant & herb extracts to soothe, relax & refresh. The manicure is done in the treatment room so you can adopt a lying position for comfort during the massage. The service includes shaping & nail filing, cuticle tidy, exfoliation, hand & arm massage & a mask is applied with hot mitts to really penetrate into any dry skin. whilst the mitts do their work, choose from a relaxing head or foot massage. a polish of your choice is then applied followed by a top coat & cuticle oil. Three step procedure which includes shaping & nail filing, cuticle tidy and exfoliation. A conditioning mask is applied while you enjoy a relaxing hand & arm massage, then a polish of your choice is applied followed by a top coat & cuticle oil. A maintenance manicure that provides the benefit of a hand soak & cuticle cream to soften cuticles, a nail file & shape followed by cuticle tidy. A polish of your choice is applied followed by top coat & cuticle oil. A facial for your feet. Our KAESO products contain extracts of plants and herbs to soothe, relax & refresh your feet. The pedicure is done in the treatment room so you can adopt a lying position for comfort during the massage. The service includes foot spa soak, shaping and nail filing, cuticle tidy, exfoliation, hard skin removal & a foot & leg massage. A mask is then applied & hot booties to really penetrate the mask into any dry skin. Whilst the hot booties do their work choose from a relaxing head or hand massage. A polish of your choice is applied followed by top coat & cuticle oil. The service includes foot spa soak, shaping & nail filing, cuticle remover applied & cuticle tidy, exfoliation & hard skin removed. A mask is then applied with hot booties to help penetrate and soften hard skin. A polish of your choice is applied followed by top coat & cuticle oil. Includes foot spa, nail file & tidy & basic cuticle work. A polish of your choice is applied followed by top coat & cuticle oil. Подробности gay online shop на сайте.